By Mark Hackett, Director of Instruction, Old Palm Golf Club Has anyone ever told you to hold the golf club only as tight as if you were holding a bird in your hand? Itâs true! The muscles in your wrists, arms and shoulders are greatly influenced by how tightly you hold the club, and loose muscles are better than tight muscles. Proper grip pressure helps produce a free-flowing, smooth swing and maintain control of the club during the swing. Tight grip pressure often results in a lack of club head speed and a slice. A good way to check your grip pressure is to hold the grip end pointing toward the ground, just like in the picture. 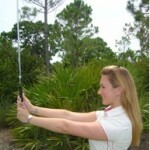 Hold the club just tight enough so that it doesnât slip through your fingers. It might seem unbelievable, but thatâs all the pressure you need. And youâll want to maintain this same grip pressure throughout your swing.